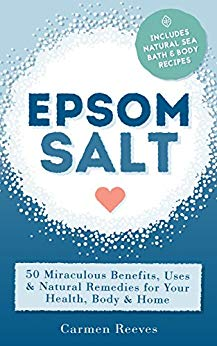 EPSOM SALT: 50 Miraculous Benefits, Uses & Natural Remedies for Your Health, Body & HomeDiscover 50 magical benefits of Epsom Salts today!This book will be your guide to learning more about a seemingly simple, everyday product that can vastly improve your mind, body, health and home. Perhaps you are struggling with a certain health problem, a garden that is lacking, or you just want to know more about this all-natural, traditional substance that your grandma used to add to her bathtub.This practical book will help you to understand what Epsom salts are, where they came from, and what’s in them. Learn how to easily whip up a simple solution for your everyday maladies - for your health, beauty, home and garden - and it only takes minutes!The benefits you’ll receive:• Detoxity your mind, body and soul with luxurious sea bath recipes• Learn how to create your own beauty products using trusty Epsom salts• Discover how Epsom salts can help you for your first-aid needs• Understand the vast health benefits of Epsom salts• Save money from expensive commercial and chemical-laden products for your health, beauty and home• Ease your body of aches and pains with soothing Epsom salt remedies• Jumpstart your weight loss program with cellulite-busting Epsom salts• Home and garden dilemmas? Epsom salts can help you!Download your copy today to reap the many benefits of this miraculous mineral!